This is my entry for last year’s FLAUNT 2014 entry. We were given a building and tasked with interpreting it as we wish – using black and white with one Pop Up color. I was given the railroad depot (of course) and chose my Pop Up color as Atlantic Coast Line purple – the railroad that came through Thomasville. I chose to present it as a Christmas catalog in the Lionel fashion. 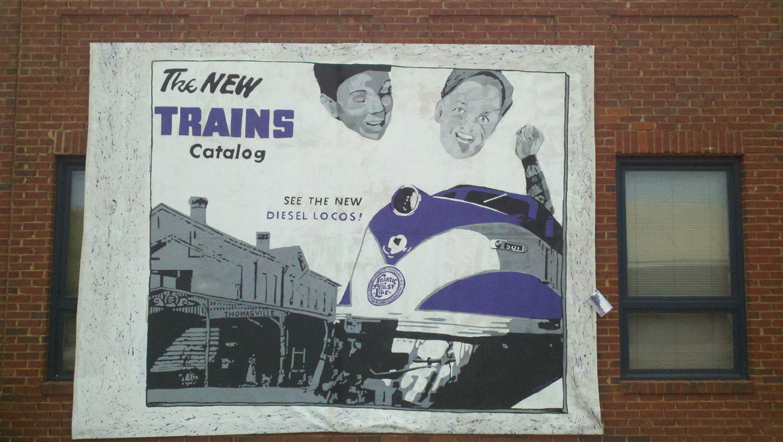 It’s shown on the side of the group of buildings just up from the depot. Next Next post: Sweet and Savory Sisters at the Train Depot in Thomasville!